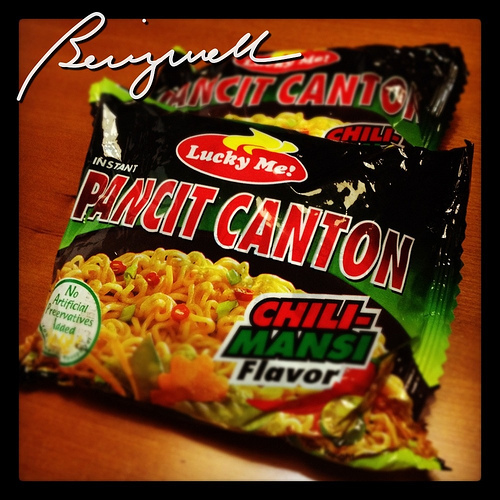 Let's try cooking egg noodle a la instant pancit canton-style! I have some egg noodle to spare, anyway. Most (if not all Filipinos) are familiar with instant noodles. One in particular is Lucky Me Pancit Canton. You immerse it in hot water; strain the noodles; mix the MSG-packed seasonings with the noodles. And viola! A tasty, satisfying meal! Believe me, it is a very handy snack. However, it is hardly nutritious. I consider it unhealthy, fatty and provide us with mostly empty calories. In contract, I'd like to share my egg noodle recipe that's very easy to do; more satisfying and most importantly, healthy. Let's start cooking egg noodle a la instant pancit canton. 1. Briefly cook the egg noodles in boiling water. 2. Drain. Sprinkle sesame oil; and set aside. 3. Saute' garlic in a very hot cooking oil. 4. Add in the carrots. 5. Add in the beans. Stir well. 6. Add in the shrimps. Stir well. Quick tip: When the shrimp changes color from grey to orange, the shrimp is cooked. 7. 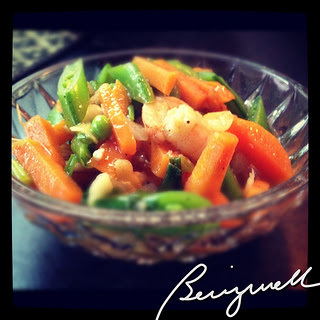 Quickly season with fish sauce and pepper. If you want your noodles to be a bit sweet, add some oyster sauce in there, too. 9. 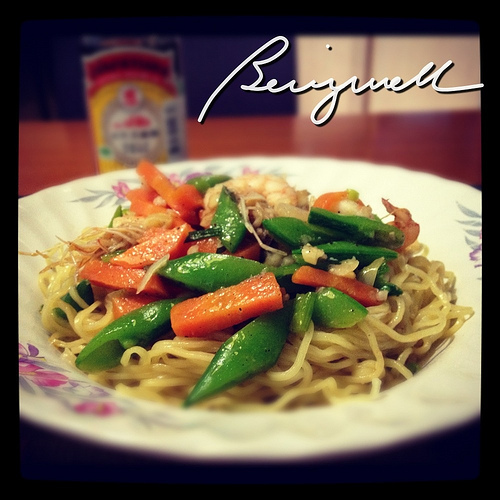 Garnish the egg noodle with your vegetable dressing. 10. Sprinkle with lime and soy sauce as desired. It may not be as quick as the instant noodles in your cupboards; but the extra effort of cooking vegetables is definitely worth every bite. Cooking egg noodle a la instant pancit canton is good for both children and adults. I just ate my fill of pancit canton with egg today! :DD Such a yummy snack! :) thanks for the recipe - adding jazz to my boring pancit canton! i do your cooking like a pro pancit canton too. sarap na, healthy pa.